Hillside Village. 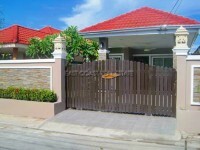 Located on the East of Pattaya, approximately 15 minutes from the City, in a nice quiet part of the countryside. Positioned on along a residential road between other neighbouring villages, it provides safe and easy access to parts of the city, or the surrounding beaches, golf courses, and parks. The village provides 24 hour security guards, and a communal swimming pool. This modern 2 bedroom house has been cared for by the owner, and they have only used high quality fittings, and furnishings throughout. Once inside the property the living/dining areas have a feeling of great space, with bright clean colourings, and well lit living spaces. The kitchen has been completely changed from the standard fitted kitchen to now be of much higher quality, topped with modern black granite work surfaces. The bedrooms are again clean, and bright with new furniture, and both the master en-suite bathroom, and the guest bathrooms have again been fully renovated to include good products, and rain showers. The garden is immaculately landscaped, and is large enough to house an outside sala to the rear for relaxing outside, shaded from the sunshine. An excellent example within this secure village.